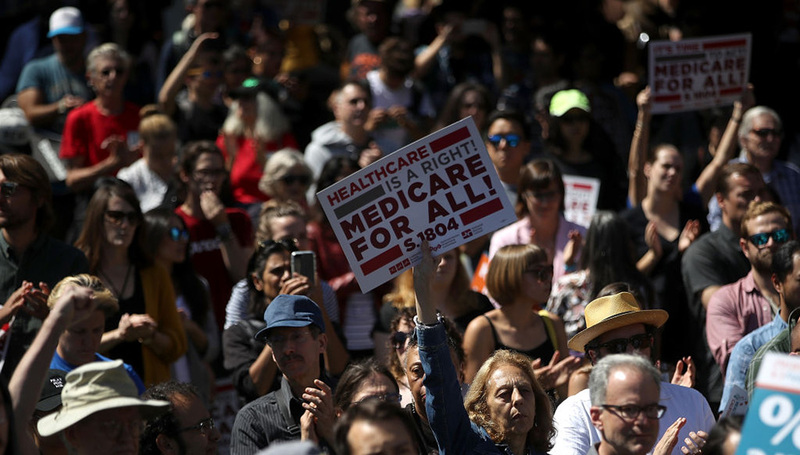 On July 31, I published a study with the Mercatus Center at George Mason University estimating the added costs to the federal government of establishing a national single-payer healthcare system. That study presented a lower-bound estimate of $32.6 trillion in added federal costs over the first 10 years of full implementation, with the caveats that this estimate reflected several extremely favorable assumptions, and that actual costs were likely to be substantially higher. Among those favorable assumptions was that lawmakers would uphold Senator Bernie Sanders’ Medicare for All (M4A) bill’s specification that healthcare provider payments would be cut down to Medicare rates, which currently average about 40% lower than the rates paid by private health insurance, and well below providers’ reported costs of providing services. Although my study as published was explicit about the nature and distribution of these cuts, some of the subsequent public discussion exhibited substantial confusion as to whose payments would be cut and by how much. This article seeks to clarify these issues. Medicare pays healthcare providers at rates generally much lower than private insurance does. These Medicare payment rate schedules are set by law, and they differ for different categories of providers. This article will focus on two especially important categories: hospitals and physicians. These categories are exceptionally important to the calculations, first because they represent large categories of national health spending, and second because private health insurance currently finances a significant share of spending within them. These factors together mean that the effects of cutting payments down to Medicare rates would be especially concentrated on hospitals and physicians. Let’s take hospitals first. This graph, produced by the CMS Medicare Actuary, shows how Medicare/Medicaid hospital payment rates compare to private insurance. As the graph shows, come 2022 (the first year of M4A’s full implementation if enacted this year), Medicare hospital payment rates are scheduled to be more than 40% lower than average private insurance rates. The gap is scheduled to grow even greater over time, due in large part to statutory Medicare payment restraints enacted as part of the Affordable Care Act (ACA). We don’t yet know whether lawmakers will maintain those restraints or relax them over time. But regardless, the text of the M4A bill specifies that payments to hospitals for treating those now covered by private insurance would be suddenly reduced by over 40%. If lawmakers do not follow through with applying Medicare payment rates to those patients’ care, or if Medicare’s own payment schedule is loosened going forward, M4A’s costs would be substantially higher than otherwise projected. We don’t know the effects on hospitals, or on the supply of healthcare services, if these dramatic payment reductions were to be implemented as written. On average, Medicare hospital payment rates are substantially below hospitals’ reported costs of providing services. The CMS Medicare Actuary projects that by 2019, over 80% of hospitals will lose money treating Medicare beneficiaries. If these data are correct, M4A would mean that over 80% of hospitals would lose money when treating all of their patients. We simply don’t know what would happen—for example, how many hospitals would stay in business—if M4A is enacted as written. Clearly there would be some disruption of the availability and timeliness of healthcare services, but no one can say how much. Physicians have a different payment schedule than hospitals, but similar dynamics apply with them as well. This graph, also from the CMS Medicare Actuary, compares physician payment rates under Medicare and Medicaid to those under private insurance. As this graph shows, physician payment rates under current Medicare law will decline rapidly relative to those paid by private insurance. In 2022, they will be about 30% lower than private insurance on average, dropping to more than 40% lower within the first ten years, with the gap widening further after that. Somewhat quirkily, Medicare’s scheduled physician payment rates are higher than Medicaid’s in the near term, but drop much lower in the long term. This means that physicians treating current Medicaid patients would get a temporary payment increase for those treatments, but even they would be cut in the long run under M4A. The aggressive Medicare physician payment restraints scheduled under current law reflect provisions of the Medicare Access and CHIP Reauthorization Act of 2015 (MACRA). MACRA replaced a previous Medicare physician payment formula known as the Sustainable Growth Rate (SGR). But Congress had routinely overridden SGR’s projected payment restraints year after year before finally repealing them. Our long experience with SGR means we would do well to take MACRA’s scheduled payment restraints with a grain of salt. If they are carried out, then M4A would mean enormous payment reductions for physicians who now accept private insurance. But if the MACRA restraints don’t hold up, M4A’s costs would be substantially higher. My study provides this information, either directly in the text or in footnoted sources. Since its publication, some M4A proponents have argued that the provider cuts are actually much smaller, and have even attacked fact-checking journalists for publishing perfectly correct explanations such as a “cut of roughly 40 percent for the treatment of patients now covered by private insurance.” These proponents argue that M4A’s large payment cuts for treating those now covered by private insurance should be reframed to look smaller, by blending them with other payment rates that would remain unchanged (Medicare’s) as well as with certain temporary payment increases under M4A (physician services now covered by Medicaid). These M4A proponents’ complaints are off-base for several reasons. First, the purpose of a study is to provide full and explicit information, not to shade the presentation to make a policy look good or bad. Transparency requires, in this context, presenting all the relevant payment rate changes separately, not mixing them together into a meaningless average. Hospitals and physicians are different entities and have different payment schedules. Payment rates are also different in private insurance, in Medicare, and in Medicaid. Any thorough study needs to show all of these differences explicitly and in detail, as mine did. Second, we should not obscure the reality that immediate cuts of 30% in certain physician payments and 40% in certain hospital payments would be scheduled and be necessary to limit M4A costs to the lower-bound estimates. Many physicians, for example, do not currently take Medicare or Medicaid patients. These providers would experience the full effects of M4A’s large cuts from private insurance rates, and this needs to be understood when considering M4A’s effects on service availability. Third, even if the provider payment cut figure were refashioned into a seeming lower percentage, by expanding the denominating range of treatments it is compared to, this wouldn’t lessen the total amount of provider cuts involved: $5.3 trillion over ten years. The cuts would still bring reimbursements down below hospitals’ reported costs of providing services, and by the exact same amount. Fourth, no clarifying purpose is served by obscuring the ~40% payment cuts. When a study or article explains that private insurance payment rates would be cut by more than 40% on average to bring them down to Medicare payment rates, no accurate reader misinterprets this as a cut in Medicare’s own payment rates. The only effect of blending a real 40% cut with a non-cut in Medicare’s own payment rates is to obscure the cut’s actual size. The text of the M4A bill specifies large and immediate reductions in payments to providers now treating patients under private insurance, cuts of more than 40% for hospitals and 30% for physicians, with these respective cuts growing more severe over time. We do not know the extent to which these cuts would disrupt the supply and timeliness of U.S. healthcare services. But without them, the costs of M4A would be substantially greater than $32.6 trillion in added federal costs over the first ten years.